I am back, alive and well! I hope you all had a wonderful Christmas and great New Year's! I've taken a little blogging hiatus to enjoy the holidays with my family and friends back in Kansas (which was so great and much needed) but now that I am back in California I am back to blogging! Woo!! 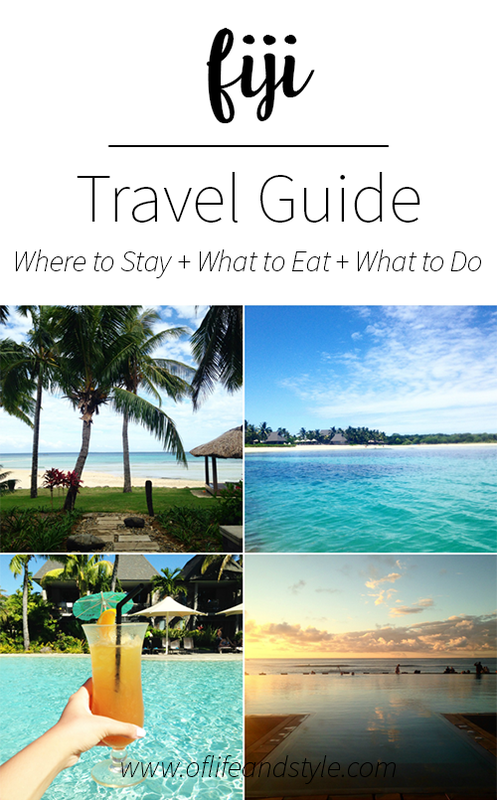 Which that means I am finally (I know I know) sharing my Fiji guide!!! Better late than never, right? 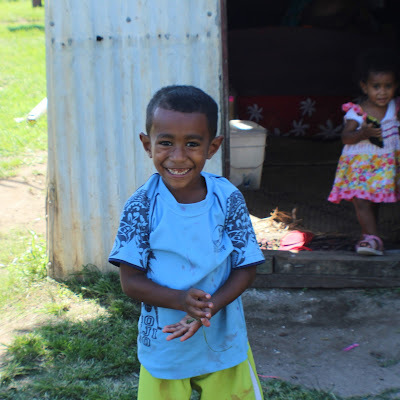 If you didn't know I traveled to Fiji at the end of October beginning of November and was there for 6 days and 5 nights with the family I travel nanny for. It was my first time traveling internationally and to Fiji so to say I was excited was a massive understatement. We stayed at an amazing resort which you'll see below and did some pretty fun stuff! So without further adieu let's get to it! Also fair warning this is gonna be a long post so bear with me. We flew Fiji Airways out of LAX on Friday night at like 11pm aka a red eye flight. It cost me around $900 roundtrip which was the most I'd ever spent on a flight but I mean I was going to Fiji and I did buy it 3 week before I left so you could probably get it cheaper. We did have meals and drinks included as well as one personal item like a backpack and one checked bag. The meals were pretty good, we had dinner and breakfast along with snacks during the middle. The flight was almost 12 hours long which is the longest I've ever flown but wasn't too bad. Since it was a red eye I slept like 3/4 of it and was only really away for the beginning, the food and the ending part. I was with a baby and a 7 year old but they were champs and slept through most of it too. The seats weren't that bad either and they gave you a pillow and blanket. Once we got into the airport we went through customs and headed to get our bags. The family I was with arranged for a private car to take us to the resort which was nice. We didn't have to stop at 10 different places after being on a plane for 12 hours. The shuttle was through Rosie Holidays and I'm not sure the cost as I didn't book it. It took a little less than an hour to get from the airport in Nadi to our hotel in Sigatoka/Natadola. 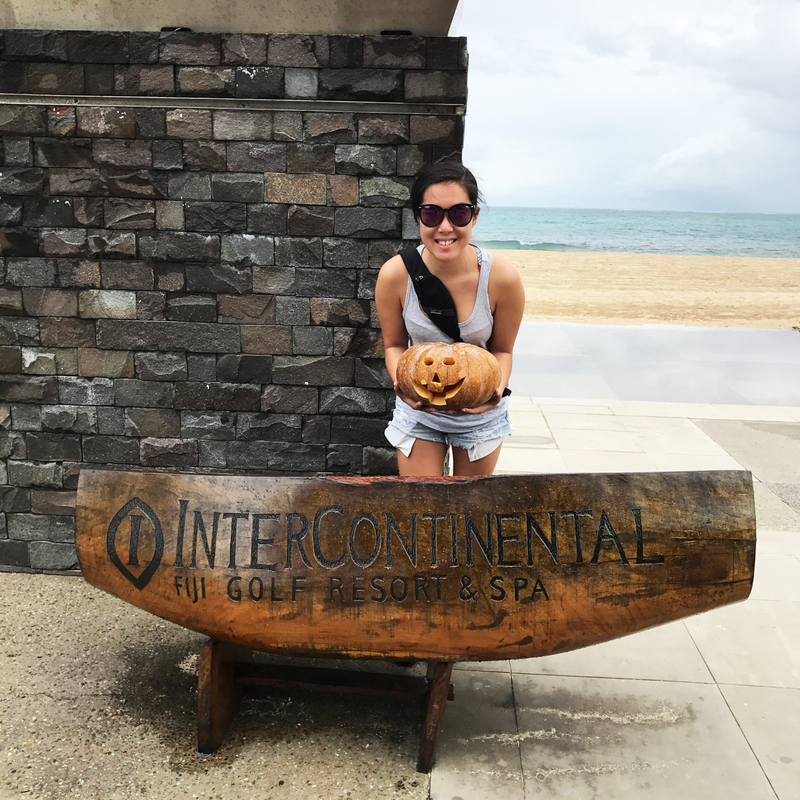 We celebrated Halloween in Fiji thus the jack-o-lantern! 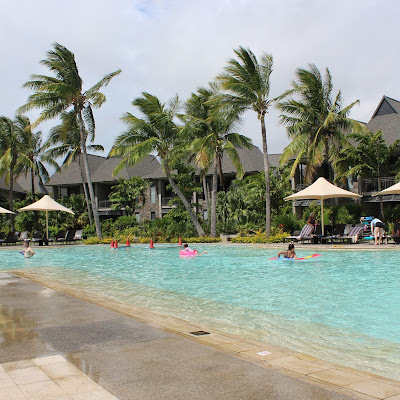 We stayed at the InterContinental Fiji Golf Resort and Spa, a five star hotel. This was the nicest place I have ever stayed when traveling. It's a beautiful resort that has several restaurants on the property, a spa, multiple pools, fitness center, kid's club, wonderful villas, beach access, entertainment, excursions, a couple of shops and a golf course. We stayed in a ground floor villa which was like mini apartment complexes. Our room was spacious, clean, modern and well furnished, the staff was soooo friendly, helpful, attentive and accommodating. The photo below is our view outside our patio. The grounds were beautiful, the pools amazing, the spa heavenly and the food pretty good. It's a wonderful resort with beautiful views and I saw all types of people there from older couples to families with little ones to couples and at the end there was a big conference there. I do have a few cons if you will about my stay. There were 4 restaurants there, one was a fine dining that didn't allow kids so that was out, another was just like appetizers and kinda weird ones at that so we only ate there once, the other was a buffet which was wayyyy too expensive $50USD and was a little too different for us and the last which we ate at almost every day for lunch and dinner had normal food like chicken and pasta and french fries. But after eating at the same place for 5 days in a row it get's old. Another thing was that we stayed on the property the entire time due to safety and that we didn't have a car. As much as I love lounging by the pool that can get old too. We did do local excursions but only one a day to stretch them out. 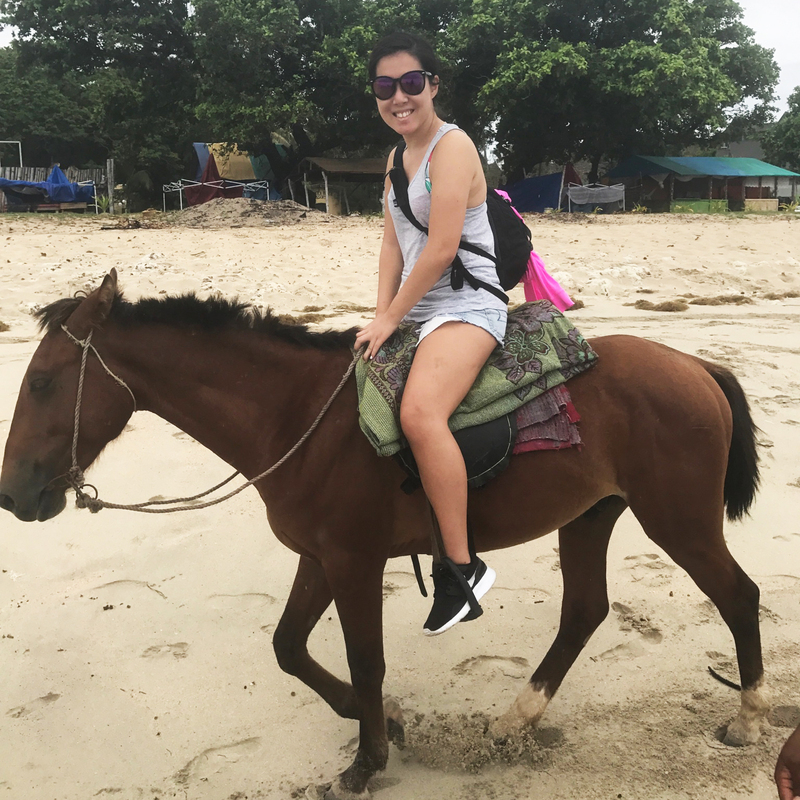 There were excursions on other parts of the island but it would be hours upon hours of traveling and with a baby and 7 year old that just wasn't doable. And they were expensive, almost $100USD. We wish there was either more to do on the property. Those are really the only two issues we had while there. The property is beautiful, the rooms clean and staff friendly and accommodating. If I were to come back I would stay for a shorter amount of time maybe 4 days which is plenty of time if you are just sticking around the resort. As mentioned there were 4 restaurants on the resort: fine dining, a patio bar, bar and grille and a buffet. American and traditional breakfast items. I don't remember how much it cost, I wanna say $25USD per day. I ordered off the a la carte menu, a coffee and apple juice and during my stay I ordered the waffles, pancakes and an omelet and they came with a little fruit plate. All three were really good and cost me around $10USD but the waffles were my favorite. For lunch we either ate poolside or at the bar and grille which was 20 feet from the pool. When eating poolside we ordered the pizza, nachos and one other thing which I forgot. 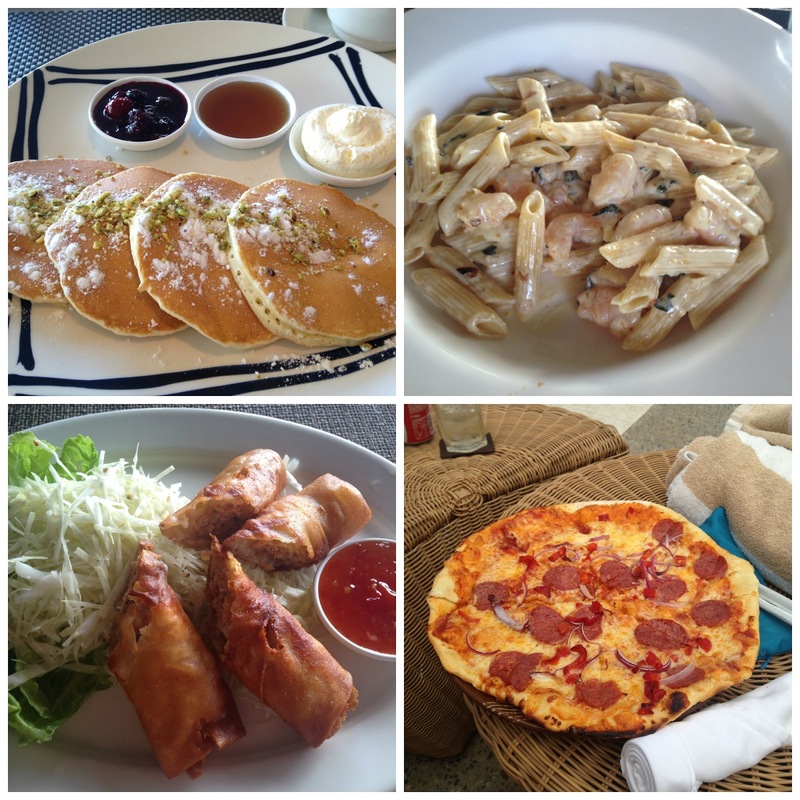 The food was really good and the perfect poolside food. I ordered one of the tropical cocktails and it definitely hit the spot while I was laying out in the little cabana thing. It was the perfect afternoon, the beautiful sun, the pool and a tropical drink in hand. What could be better? The bar and grille had good food too and that's where we ate dinner almost every night. To be honest I ordered off the kids menu because A) I'm not a big eater and couldn't justify ordering the regular meals and wasting them and B) they were pretty pricey $20USD or more and I was on a budget and the kids meals were only $6USD.... The food was just as good and filled me up so it was a win-win. I did order the shrimp alfredo pasta and it was sooooooo yummy. Some of the best I've had. I also had these like eggroll type things which were out of this world good too. I definitely recommend those two items as well as the pizza and nachos from the pool. I wish there was more restaurant options but overall it wasn't too bad. The food was delicious and not too pricey. You can definitely get a good meal for your dollar! Would you believe that I had never gotten a massage up until Fiji? I knew that while I was there I wanted to get a massage and treat myself to a spa day. The second day we were there it was rainy/dreary out so it was the perfect day to spend a few hours at the spa relaxing. There was five "steps" to our spa day. The first was to put away our stuff and get dressed in robes and slippers. Next was the relaxation room where we had lemon water and could relax before our massage. After was the "prep" room where we showered, sat in the sauna (amazing), the hot tub (I could have lived there) and then finished with an ice shower. Once we did all that it was time for our massage. I got just a basic coconut oil massage which ran me $90USD. It was an hour long and absolutely dreamy. So wonderful I fell asleep like 10 minutes in. After we headed back to the "prep" room to shower, sauna and sit in the hot tub for a bit. After we got dressed and headed back to the room. It was such a great experience and I can't wait to get another one! On the property the resort had a water excursions hut where you could rent scuba and snorkel equipment, paddleboards and kayaks. I love kayaking so I rented one I think it was $18USD for an hour and went out kayaking in the gorgeous waters. It was so peaceful to paddle out and watch the fish swim under me and see the reefs. The resort had two pools, an adult only (above) and a family (below). We primarily hung out at the family pool but I did lay out at the adult only pool on my last day. It was so nice and relaxing and had a beautiful view of the ocean. It was paradise! The family pool was really nice too. It was super big and had little waterfall things in the middle the kids could swim under. 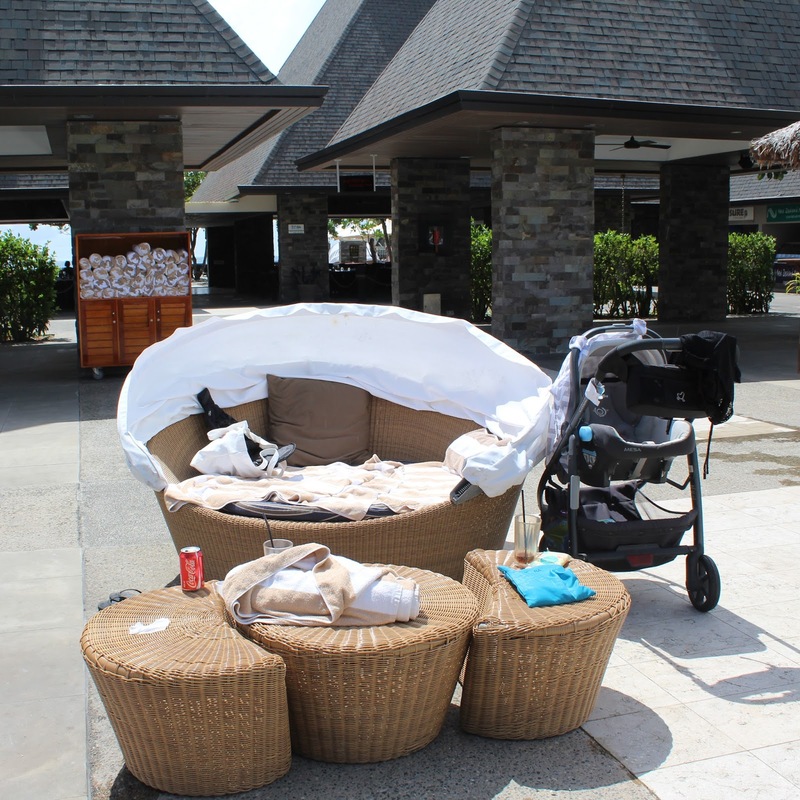 They had umbrellas and loungers everywhere and if you were some of the lucky ones you could grab these little private-ish cabanas which was soooooooooo nice to lounge in. They also had poolside eats and drinks (see the food section) above which was amazing. I mean what's better than eating pizza poolisde? The resort backed right up to the beach and ocean so we had direct access to it. Our room was about 20 feet from the beach and we could walk out directly to it which was so nice when you had a stroller and lots of beach bags. The beach itself was filled with seashells and pieces of coral which was so fun to walk and look for cool shells but it was not nice on your feet. We had to wear flip flops when we walked on it or else our feet would have been tore up. Since it was so shell-y you couldn't really lay out on the beach :( But that's okay cause we had the little cabana things at the pool. The water was sooo warm and just felt amazing. It wasn't very deep at all and I could wade out to the reefs and still touch (I'm 5'1" for reference). Since there was reefs there was marine life and I went and free snorkeled (see the snorkel section). Most of the employees at the resort lived in the local village just a few miles away. Fiji is a third world country and many of it's citizens are very poor. 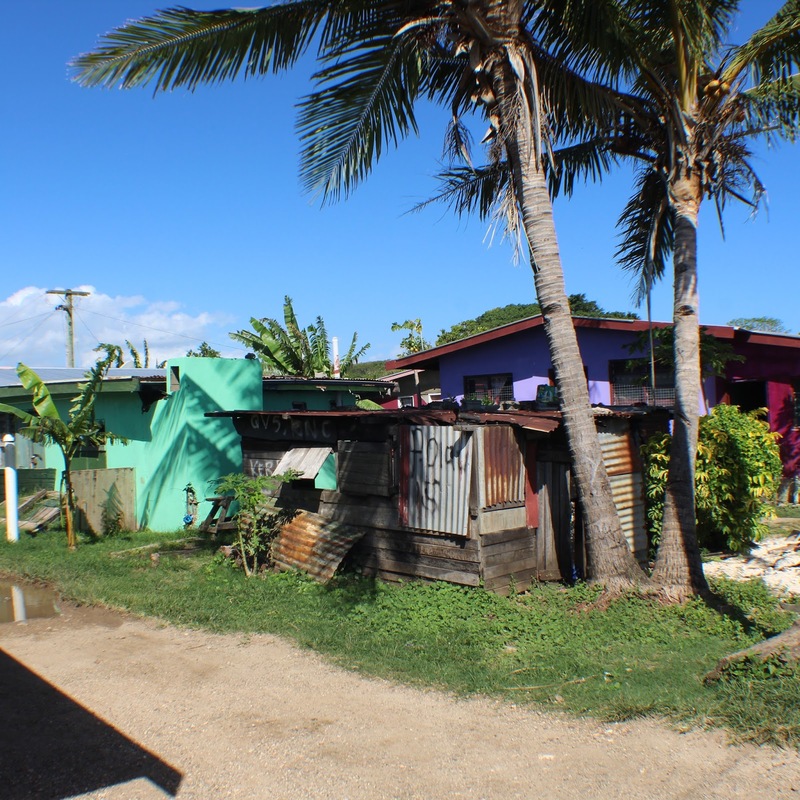 I had never been to a third world country but I wanted to see and experience how these people live. The resort offered guided tours that lasted a few hours and took us to the village and showed us around their community. It was $15USD per person for the afternoon. The guide was an employee of the resort and who lived in the village who walked with us to the village, a couple miles from the resort. Once we got to the village a community member was our tour guide and showed us around. It moved me to the point of tears seeing how these people live. In filthy conditions for shacks for homes and a handful of possessions. But they were so happy. Not a single person we passed wasn't smiling or saying "bula" (hello in Fijian). The kids were so happy following us around and waving. At the end they took us to their community hall and we had kava, a traditional Fijian drink and the community leaders led us in song and dance. It was one of the most profound experiences of my life and one that I will never forget. It reminded me that we have it so well here in the States and we should be immensely grateful for all we have. It was a nice reality check if you will. If you ever go to Fiji I highly recommend taking a village tour. 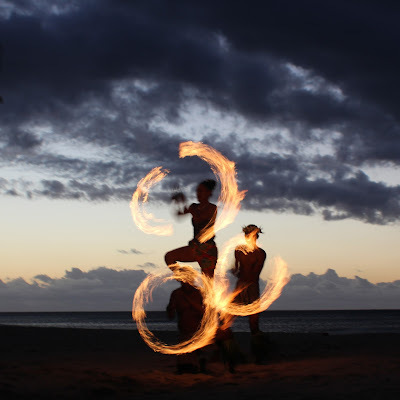 During our stay in the evenings on some nights there would be a fire show/dance performance that show cased Fijian dance. It was a short program about a half an hour that took place on the outside patio. It was so cool to see the fire twirlers and dancers and they even got members of the audience involved! A fun evening for sure! We went snorkeling twice, once with the locals and another time with the water sports through the resort. The snorkel with the locals didn't really have any fish but it was a good time! They were crazy and fun and really nice. The snorkel with the resort was on a glass bottomed boat which was super cool to see all the ocean life below. I saw a few fish and swam through a school of striped ones (see the video)! I also did a free snorkel by myself just from the beach and it was really awesome. There were reefs and I swam through them seeing quite a few really cool fish! So that's my Fiji guide! I know it's not as informative as my Hawaii one since we only stayed at the resort but it was a pretty awesome time. I am so fortunate to have been able to be given the opportunity to go. 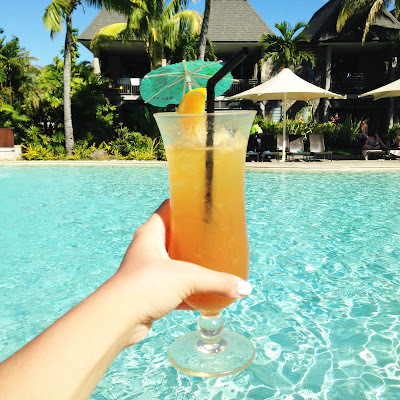 Fiji is a beautiful country and I would definitely recommend going if you want to get away from all the hustle and bustle and stress of life or if you want to disconnect from your phone. I wish we could have explored the island but we didn't have any way to so I'm kinda bummed about that but I still had an amazing time. Where have you traveled to that was just unbelievable? Where should I travel to next? Since I've started blogging almost 3 years ago this March I have done one of these posts (2014, 2015). It's fun to reflect back on the year and see all of the fun, incredible and amazing things I've accomplished. It also makes me think about all the things I didn't do and want to do for the upcoming year. 2016 was a wild ride for everyone. For society, the world, I think every single person on the planet was effected. It had it's good and it's bad but nonetheless we conquered another year. It was also the year of a lot of firsts for me so with that being said let's get into all the firsts of 2016! October of 2016 marked the first year of my family and I living out in California! That's crazy to me that we've already been there a year. It doesn't feel like just one but like ten! I've split my time between Kansas and there but love it. From the weather to the people and just the great atmosphere out there. I have loved my year in California! Every year I travel more and more and check off more places on my bucket list. This year I checked off Las Vegas, Hawaii and Fiji. 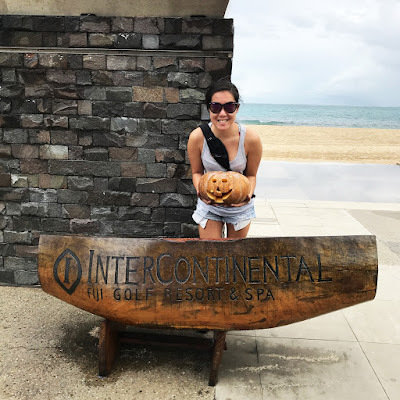 It was my first time to Hawaii and I absolutely loved it! I had the best time and can't wait to go back and explore the other islands! It was also my first time traveling internationally which was quite the experience. From getting my passport in 3 weeks to going through customs to traveling back from Fiji by myself. But now I can say I've done it and now I feel like I can do anything! In 2017 I want to travel abroad more and have my sights set on Australia, England and Mexico. We'll see where the year takes me! In May one of my best friends came out to visit me for the summer and we went to Disneyland for the first time! We spent the entire day up there and had the best time of our lives. It was so much fun and we had a blast. I can't wait to do it again! I know it seems bougie of me that it took me 22 years to take public transportation but it has! It's easier to drive everywhere in Kansas and get places faster than it is in California. I first took the train when I went up to Disneyland in May and since then I've taken the trains and buses all throughout Southern California from LA to San Diego. They're really nice, pretty inexpensive and can take you basically everywhere. I will definitely be using it more this next year! If you didn't know I am studying hospitality management with a concentration in event management aka event planning and I plan on becoming an event planner. In California I saw a lady looking for an assistant to help her with her vintage event rental business. I reached out and sent her my resume, we had an interview and I was hired! While it's only been a few months working together I love it! My boss is amazing and I love what I do. It's given me the opportunity to step inside the event world and get a taste for what I would be doing and meeting all of the industry professionals in the area. It has been an amazing experience and I can't wait for more in 2017! This summer one of my best friends Katie came to me and told me about this idea she had of starting an online community for girls where they can come to and feel encouraged, supported and inspired. I told her I LOVED the idea and I want to be a part and support her 100000%. Within a couple of days Tribe 21 was born. We launched in October and since then our response has been unbelievable. We couldn't have expected or predicted the response we got from launching. It has been one of the best things about 2016 and I honestly can't wait to see where it leads in 2017! 2016 was a year of a lot of firsts for me and a lot of new experiences but it made the year amazing, unforgettable, incredible and one of the bests. Thank you to all my readers, followers and friends for sticking with me on this journey and helping me along the way. I honesty couldn't have done it without you. Here is to a great 2016 and an even better 2017!